Life of The Party mission has known bug which causes the fog to disappear farther from the starting area. But I fixed the problem and now the fog can be seen everywhere in the mission. I also fixed another problem in Shipping and ... Receiving, but seems like no one noticed. That looks great! And ATI have fixed their frivers, so Its worth me downloading. 1st of all - thank you for the fix - always wondered why fog was disappearing further in the level. now Q: is the 1st shot how it should look like? I mean, the wall/structure in the middle of the pic doesn't look like it is behind any fog. It gives the impression that fog is only working partially - only on very distant objects. Is it correctable or even should be (it doesn't look natural to me right now)? Last edited by Hiatus; 13th Feb 2008 at 12:23. That wall is just closer than fog distance. so the wall of fog starts abruptly at fixed distance in T2? Hiatus, this problem in drivers. See Newest ATI Catalyst Drivers Show Perfect Fog In T2. Winter Cat, you've done the community a real favour with this! I made my way to Angelwatch and it is truly a stunning sight. A bright church of a religious sect (with the bad things behind the front). Last edited by Calibrator; 16th Feb 2008 at 12:54. Winter Cat, I remember playing thief2 on my old ATI 8mb card many years ago, and I dont remember if I used a fog fix or what but the fog was correct around angelwatch, also the fog in Precious Cargo wasnt as thick, you couldnt see it as heavily in the caves where you begin until you made it outside. Is there a chance to fix that level as well? lower the fog level just a bit. If you want you can change its distance in Precious Cargo yourself then re-portalize for the effect to take effect, but the original fog is ok. The point in LotP was to fix fog but keep its original settings, I actually just re-portalized, re-optimized, re-lighted level. Anyone can fix LotP fog, but for those who's lazy to do it I made fixed mission. OK, I dont know what re-portalizing means but im sure anyone who used the editor does. 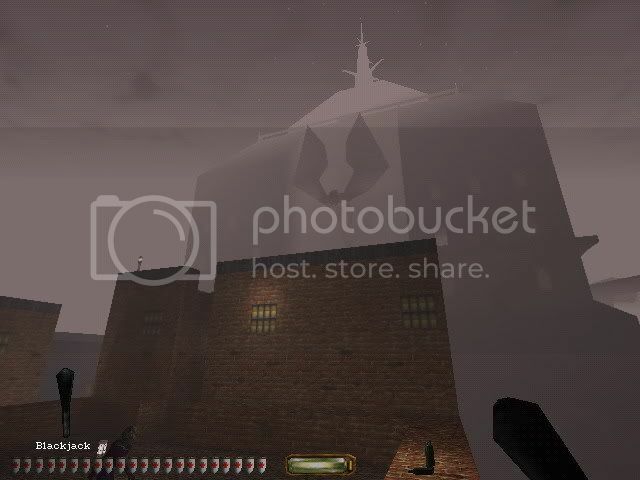 The one thing i noticed about the Life of the Party map, with fixed or without fixed fog... was that when I used Catalyst 7.9 and it didnt have fog, the sky was black with stars (the way it was meant to look originaly, the way i remember playing it back in 2001), and then with Catalyst 7.12+ the fog is there but the sky is white, when you approach angel watch you see the white sky with ugly black buildings painted on it (this is with or without fixed mission). 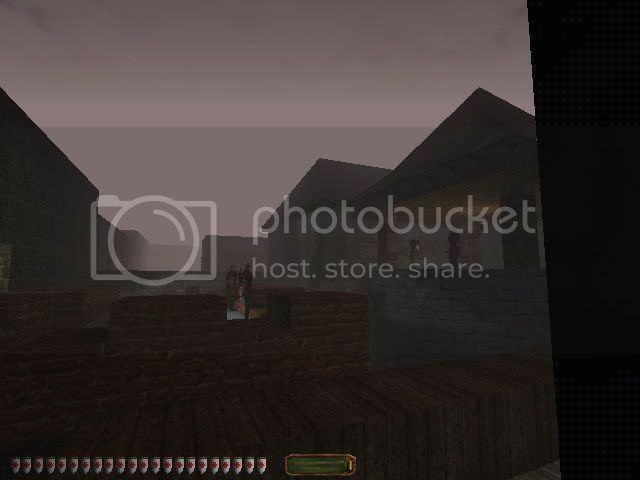 The way I remember the game when i played it on some old ati card 8mb with probably catalyst 1.0 at the time, was that the sky was black with stars, there was some fog, not too heavy, but it didnt turn the sky white, just created a dark gray haze towards the sky and was whiter towards the ground, the sky texture was still visible. This is just from memory too but there was fog around the bell tower and when you approached angelwatch, and not much in between. either my memory is broken or thief 2 on new systems is broken. I have an ancient ATI Xpert 2000 pro card (uses ATI's Rage 128 Pro chipset), and it does show fog, although it's not perfect. I think it displays the "wall of fog" effect; when I wander around, fog suddenly starts about one meter ahead of Garrett. Anything closer than about 1 m is rendered as if there was no fog. This is clearly visible if I walk along a wall to my left or right; the "beginning" of the fog moves around with me and is always located about 1 m ahead of me/Garrett. An old nVidia TNT2 Model 64 video card does show "proper fog": Fog starts right in front of me; there's a smooth transition from almost clearly visible things immediately before me to almost completely hidden objects several meters ahead in the fog. As far as I can tell, fog completely vanished with ATI Radeon cards. Older ATI cards should display at least some sort of fog. Many cards from other manufacturers show fog as well. The operating system and any hardware other than your video card are usually not important for these fog issues. I also played thief 2 on my Geforce 2 Ultra few years back, and it looked correct too. But for you does the sky still look black as it should? if the sky is white and has black buildings painted on it, then its not completely correct (you can see this when you approach Angelwatch tower). Last edited by Cold0ne; 11th Mar 2008 at 07:39. Your memory isn't broken! Earlier when you had older video card you played Thief 2 Demo mission which, it has black sky and slight fog. 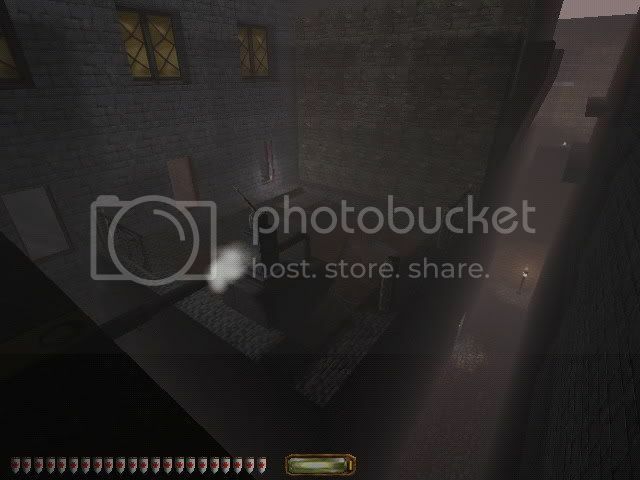 http://www.ttlg.com/forums/showthread.php?t=116952 In full version of Thief 2 the sky is white when the fog is on. Ohh man, thank you for that thread, yes, thats how i remember it. See i knew i wasnt crazy, i remember the fog being a dark gray and the sky being black, thats how it should look i think. the white night effect is pretty strange in a thief game. Is there any way you can make the game use black sky like the demo and make a 2nd version of the fixed map? i know when i used ati drivers 7.9 i had a black sky in that mission recently so both textures exist its just which driver telling the game to use what sky but it can probably be forced to use a certain one through dromed. The sky isn't affected by drivers, it's set in the mission itself. But for you does the sky still look black as it should? if the sky is white and has black buildings painted on it, then its not completely correct (you can see this when you approach Angelwatch tower). The sky displayed with the ATI Xpert 2000 pro does look neither completely black nor white. I can see a dense layer of greyish, partially transparent clouds moving before a background with many stars and the moon. Looks comparatively convincing, although it does fit the early evening better than the middle of the night. The only thing that's definitely not right with this sky is a horizontal set of stripes in various shades of grey ranging from white to dark grey, but this is actually distant fog badly rendered. It's visible as well if one is standing near some very deep abyss, looking down. It vanishes once I disable fog in the game's options menu. This might explain why the grahics card's drivers apparently change the sky's appearance. In the original LotP, there's no fog visible near Angelwatch, and the houses look OK there. The altered version shows almost white houses near Angelwatch (and everywhere else). This is another fog rendering bug with this ATI card; it's not visible with the nVidia TNT2 card I talked about earlier. I have not played the altered version of LotP with the TNT2 card (yet), so I can't tell you how the sky looks with that card. By the way... The new version of LotP apparently is a bit "over-fogged"... there's fog outside the buildings as well as inside - or is this another bug in the video drivers? I only reportalized, reoptimized, relighted mission. I didn't touch fog option on room brushes. That's just LGS desired the fog to be everywhere like in The Unwelcome Guest. for me definitely when i install the 7.9 drivers i have a black sky with stars in that mission...and when i installed 7.12 drivers now the sky is white with black buildings painted on it near the bottom, looks hella ugly. Any chance of a resharing of these files? The rapidshare link is dead... thanks! Awesome, this did nothing for me... I really loathe my laptop... right now.